Titanium ray brooch. Natural color titanium grey hand crafted titanium ray brooch. Unique titanium jewelry. Eagle ray at santu pretu. Silver 925 and 14 carat gold and moonstone ring. 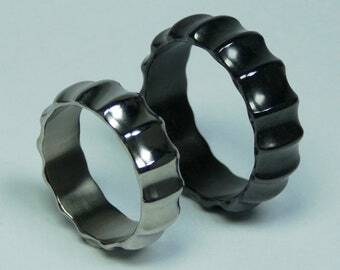 SET of black polished zirconium ring "Ammonite" and polished titanium ring "Ammonite". Zirconium and titanium hand crafted pair of rings. Solid hand crafted convex shaped titanium bangle bracelet with blue anodized grooves. Titanium jewelry. Mens bracelet. Mens jewelry. Announcement Thank you for visiting our web-shop here on etsy! We hope you'll find something that suits you. If you do we will send it to your adress with postnl in a gift box and well packaged. We have all our listed jewelry in stock so we can send it in 1 or 2 business days. For custom orders it can take 3 up to 10 business days, depending on how many orders we have. We always do our best to ship a.s.a.p! Combined shipping is also possible. Thank you for visiting our web-shop here on etsy! SET of anodized titanium choker and dangle earrings on silver hook. Titanium jewelry. Titanium necklet. SET of anodized titanium and silver dangle earrings and brooche. Titanium jewelry set. Pair of all around random facetted zirconium wedding rings, engagement rings. Zirconium jewelry. Zirconium rings. Colorful anodized titanium bracelet. Titanium jewelry. Pair of silver and colorful anodized titanium dangle long earrings. Titanium jewelry. Anodized grade 2 titanium cuff bracelet. Titanium jewelry. Pair of silver and anodized titanium dangle earrings. Titanium jewelry. Long colorful earrings. Colorful paterns anodized titanium bracelet. Titanium jewelry. Mens jewelry. Mens bracelet. Anodized titanium cuff bracelet. Titanium jewelry. Pair of silver and anodized titanium dangle drop earrings. Titanoim jewelry. Earrings. Pair of silver and anodized titanium dangle earrings. Titanium jewelry. Titanium earrings. Pair of silver and colorfull anodized titanium drop dangle earrings. Titanium jewelry. Long dangle earrings. Pair of silver and rainbow color anodized titanium dangle leaf earrings. Colorfull earrings. Pair of anodized titanium and silver dangle earrings. Titanium jewelry. Tear drop earrings. Anodized titanium bracelet. Titanium mens bracelet. Mens jewelry. Titanium jewelry. Pair of rainbow colors anodized titanium and silver dangle earrings. Drop shape dangle earrings. Titanium jewelry. Anodized titanium cuff bracelet. Titanium jewelry. Titanium bracelet. Rainbow color anodized titanium dangle earrings on silver hook. Titanium jewelry. Earrings. Rainbow colors anodized titanium and silver dangle earrings. Titanium jewelry. Anodized titanium triangle brooch. Titanium jewelry. Modern brooch. Anodized titanium brooch. Titanium jewelry. Anodized titanium triangle modern colorfull brooch. Titanium jewelry. Anodized titanium brooch. Titanium jewelry. Triangle brooch. Modern jewelry. Jadeite discus 50 mm and 925 silver pendant on a 925 silver necklace. Jadeiet jewelry. Turkoois disc and silver pendant on a silver necklace. Turkoois jewelry. Anodized titanium cuff bracelet 25 mm wide. Titanium jewelry. Anodized grade 2 titanium cuff bracelet 30 mm wide. Titanium jewelry. All around facetted titanium ring. Titanium ring 12 facets. Titanium mens size ring. Titanium jewelry. Anodized titanium cuff bracelet 55 mm wide. Titanium jewelry. SALE. SET of colorfull anodized titanium and silver brooch and dangle earrings. Titanium jewelry. Brooch and earrings jewelry set. Anodized titanium and 925 silver brooch. Flower jewelry. Flower brooch. Just what we were looking for, thanks! love it! Anodized titanium cuff bracelet. Mens titanium bracelet. Titanium jewelry. Titanium mens bangle. Have been looking for jewelry like this for years. Bought some pieces years ago and they still look like new. Love the large size and color. Took a while to receive, but coming from Amsterdam, I guess that is to be expected. Was well packaged and am very happy with the piece. Solid titanium men's size bracelet. Titanium jewelry. Men's jewelry. Our work shop / jewelry shop on the nice western islands of Amsterdam. This is where all the magic happens! Some of our forming tools. The notorious home made ac-dc machine for anodizing. Sigrid her passion for flowers. Jewelry creators with a passion for color and nature. graduated at Vakschool Schoonhoven in the Netherlands. We also met each other at that school. We have been creating jewelry for over 30 years now in our studio at Grote Bickersstraat 44A on the nice and peacefull western islands of Amsterdam. You can also visit our studio tuesday until friday 10.00 - 18.00 and saturdays 10.00 - 17.00. Since the start of our studio we like to work with titanium because of the possibility of coloring this metal by anodizing. The toughness and strength of titanium also offer other possibilities in our design, which the weaker metals like silver don't have. We like to combine (anodized) titanium with silver or gold in our jewelry, all hand crafted with great care. Wim is specialized in anodizing titanium, Sigrid isn't. She got shocked by a short circuit once and now she refuses to work with the ac-dc machine. Beside the colors of anodized titanium we also like (semi) precious gemstones and as you can see in our web shop a lot of our jewelry designs are inspired by nature.